Prunesco will be participating for the 5th time in the 24th version of the GulFood 2010 Exhibition which will be held between February 21 and 24 in Dubai, United Arab Emirates. The company, devoted for almost 70 years to dehydrated prunes processing and packing, will be included in the pavilion representing Chile, located in Hall 3, number A3-30 and B3-29. The idea is to position itself as one of the main prune suppliers for the North African and Middle East markets. 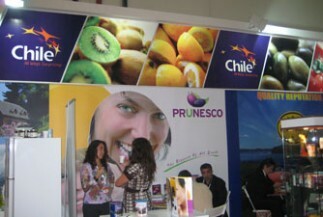 GulFood 2010 is the most relevant exhibition of the food sector in the Middle East and Prunesco will be present therein with its broad variety of products comprising natural prunes, tenderized prunes with and without stone including juice and paste which can be packed in the most modern containers. In 2009, the exhibition that takes place at the Dubai International Convention and Exhibition Centre, had the attendance of 3,300 companies from 76 countries and recorded a 20% increase in visitor attendance in comparison to year 2008, with a total attendance of 45,489 persons.